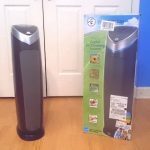 In my comprehensive comparison of the GermGuardian AC4825 vs. AC4900CA I’ll cover the specific differences and help you decide which one fits your needs better. If you’re shopping it can be very confusing when comparing these two wonderful models. Believe me, I understand how it feels! I’m a proud GermGuardian owner myself so I’ve decided to share my first-hand knowledge with you after personally owning and testing both. Both models have some good and bad points as they’re from the same basic design family. Let me tell you up front – don’t worry! They’re both great choices and well worth the investment. 10. AC4825 VS AC4900CA Pricing – Is there a difference? With a huge number of similarities shared between them, it can definitely feel a bit confusing and possibly even a little bit frustrating when trying to compae the two models. Sadly, GermGuardian doesn’t make the differences clear and they certainly don’t make it easy to compare the two in terms of technical and performance aspects. To make matters worse, the owner’s manuals are slightly different and don’t clarify things. For example, the AC4825 owner’s manual lists several specifications that aren’t listed in the manual for the AC4900CA. In order to make things more clear I’ve gathered all the specifications and arranged them in away that’s easy to compare. Let’s get the basics out of the way. Here’s a side-by-side comparison of the features and specifications of each. I’ll go into more detail about the similarities and differences between the two afterwards. As you can see, these are essentially the same unit. Both share the same great features and performance that make the AC4825 so popular. It’s one of the best-selling air purifiers today – check out the amazing number of buyers over at Amazon, for example. Both purifiers perform well and there’s no noticeable difference in air cleaning quality. And there certainly shouldn’t be; they both use the same exact filter. It’s pretty cool to see (or should I say, smell?) how quickly they remove odors like those from burnt matches in the room where I tested them. Both the AC4825 and AC4900CA feature the same design platform. They’re made of similar internal components right down to the control board, motor, and the general design. Both are well-constructed, housed in a strong ABS plastic body. The units are both operated with an easy-to-turn (but not flimsy) rotary fan speed control switch. The UV germ-killing feature, activated by an on-off button, feels solid as well. Note that if the unit is turned off when the UV feature is on, you’ll have to turn the UV option on once again the next time you use it. There isn’t a memory feature for that. For convenience, as both models are extremely similar in design, I’ll use some images and descriptions from the AC4825 to illustrate and explain more about both models. The sibling purifiers use a single electric motor driven by an solid-state speed controller. The electric motor is connected to not one but two fan assemblies which resemble cylinders with fan blades. And before I forget, both also have a built-in handle at the top rear. 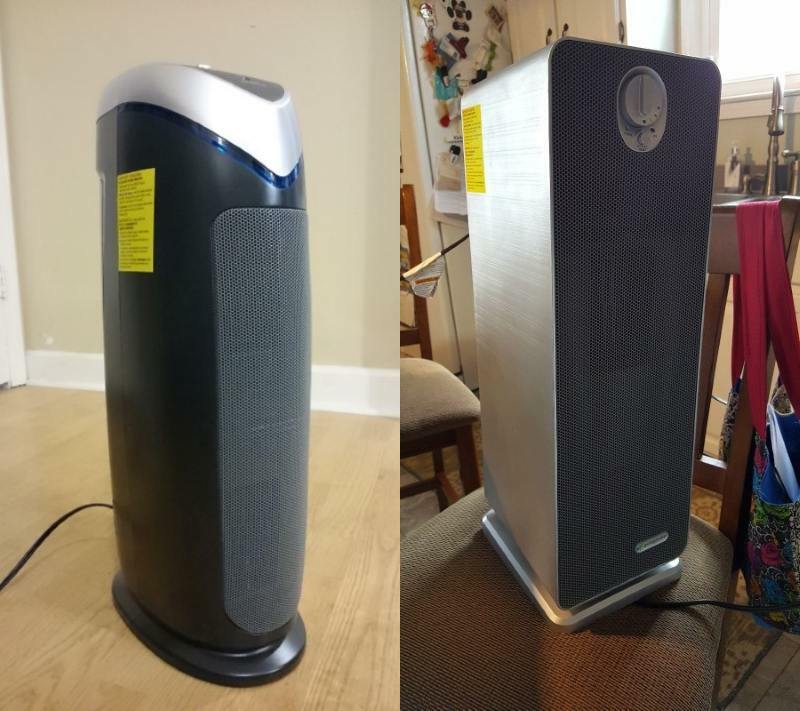 It’s actually very handy as while the air purifiers weigh a bit under 10 lbs, they’re rather tall and cumbersome to carry. This makes it easier in my experience. 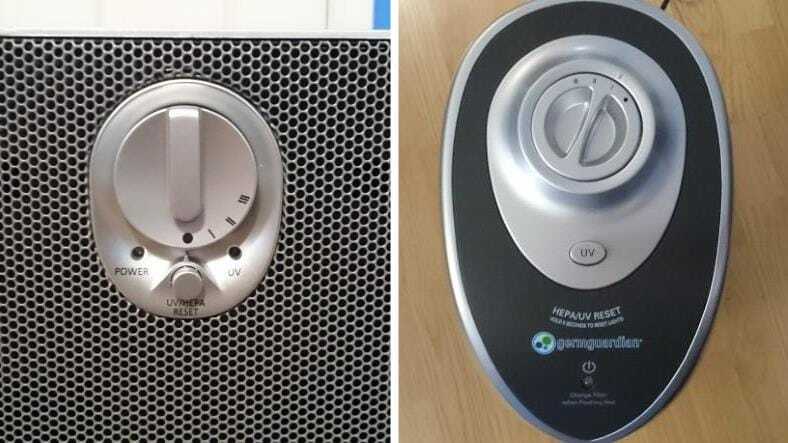 While the AC4900CA may seem unusual and you may be asking yourself, “Why did they make this one?” GermGuardian actually produces quite a few different products and the air purifier line also includes the smaller sibling called the AC4100. It’s like the little brother to the AC4900CA and a great little small room air purifier. It covers about 89 square feet of room size vs. the 155 of the AC4900. 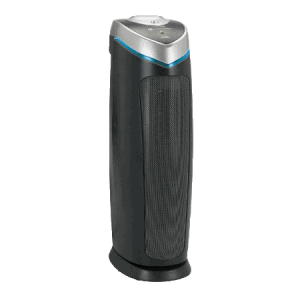 The GermGuardian AC4900CA actually shares its same cosmetic design and features with its smaller sibling, the AC4100 shown here. I prefer the style. It’s a modern & contemporary design that really compliments what is already a great air purifier. It reminds me quite a bit of a home stereo loudspeaker. It essentially boils down to your personal preference in styling. However, one thing to bear in mind is that there isn’t a similar smaller version of the AC4825 like there is of the AC4900CA. Why does that matter? 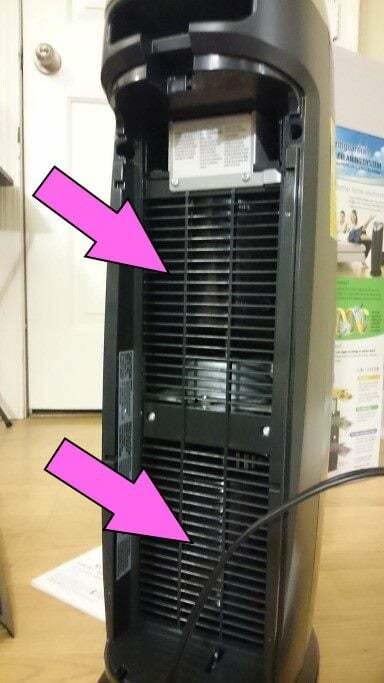 Because if you’re planning to add more purifiers in order to clean the air in your whole house, you won’t be able to have a matching set unless you use the AC4900CA and AC4100 instead of the AC4825. Therefore the AC4825 is actually a bit oblong as it is shaped with a bit more of an ellipse shape, depending on how you look at it. Personally while I love both models, I lean towards the style of the AC4900 because it’s slightly closer to being square in shape.. That’s completely a matter of personal preference. The flat front grill looks very nice to me. In either case, you’ll need to make sure you have sufficient room wherever you plan to use it due to the tall height. Ideally you’ll place either in an area where airflow isn’t restricted. The front and back, where air exit and enter respectively, should have 1-2 feet or so of free space to ensure air can flow freely. After digging in and evaluating both, I was able to see just how similar the two models are. Not only do both share the same design, good performance, and features, but they also share the same “whirring” noise I’ve known about for a long time that the AC4825 has when it’s in use. 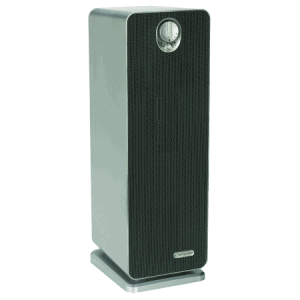 While not a bad thing exactly, it’s a characteristic of these “tower” style air purifiers. It’s due to both the electric motor system as well as the 2-rotor fan design. The electric motor in both purifiers produces a slight “whirring” sound with a little bit of an undertone, so to speak. It’s largely due to the motor being driven by an electronic solid-state motor controller which rapidly switches the electrical power to the fan on and off to maintain a fixed speed. I say that to make you aware that neither model is perfectly silent on the lowest setting, although they are both very quiet indeed. Unless you’re the lightest sleeper like me, the low setting is very quiet and both operate with low noise. I carefully measured volume levels using a great little digital sound level meter at 1 meter (3.28 ft) from the purifier. They’re basically identical in fan volume, as you can see (it tends to be a bit higher when they’re new and haven’t fully broken in yet). Both are very quiet on the lowest setting! That’s similar to another competitor in their price range, the Levoit LV-H132. 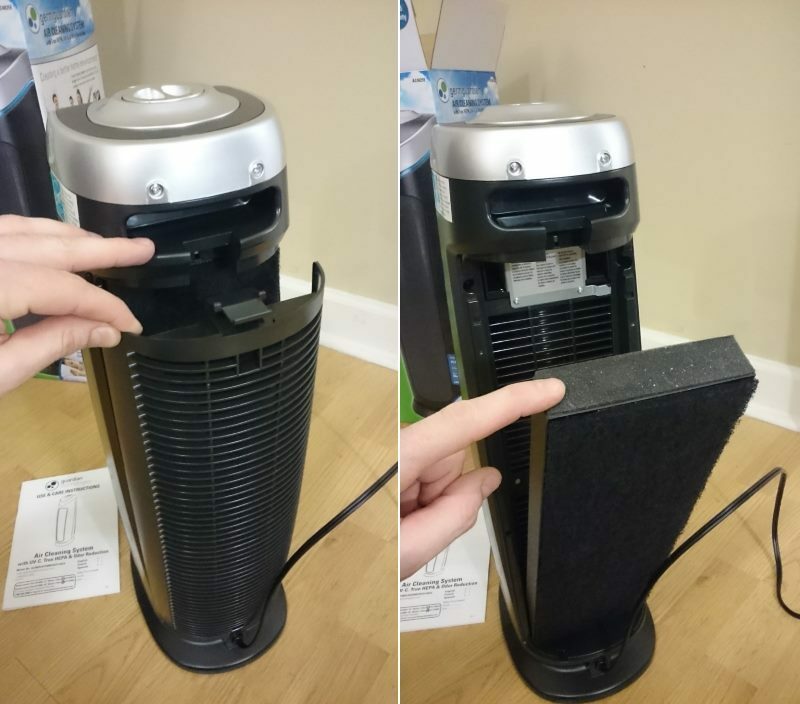 The germ-killing ultraviolet light (UV) bulb (left) and the replacement HEPA filter with activated carbon filter section (right) are the same for both models. Expect to spend around $25 for the bulb and somewhere between $30-35 for the filter. The GermGuardian Filter B (FTL4825) serves as the replacement for both models. Additionally, the UV bulb (the LB4000) is the same as well. You don’t have to be concerned that buying one model means paying more when it comes time to replace the filter or bulb. In this case, there’s no difference. You can expect roughly 6-9 months of use from the filter before replacement, although that varies with use & needs. Heavier conditions and heavy odors or substances in the air will shorten the life. Likewise, for low-demand conditions like in my home, you can expect the filter to last longer. You’ll still need to check the filter manually and reset the filter replacement reminder yourself, as there’s no way for the purifier to know how soiled the filter is. That’s not a feature available in products at this price point. Filters can be replaced as a set (HEPA filter + the carbon filter section) or you can also replace just the carbon filter if needed. That’s especially helpful if you have pets, cigarette smoke, or other odor-causing contaminant sources which will eventually be absorbed by the carbon filter and will require a replacement to restore the effectiveness of it. Both models are technically specified as providing 155 square feet room size coverage which is just above the space provided by a 10 x 15 foot room. Note, however, that GermGuardian lists both models as covering a “medium sized” room. Additionally, plenty of other owners report using it in larger rooms and even their living rooms with great success. For both models, the power light (a soft-glow LED) is normally green during standard operation. It will turn red and flash as an indicator when the filter needs to be checked and possibly replaced. You’ll need to reset the reminder which is very easy to do by simply pushing and holding the UV control button for 5 seconds. One area where the two differ is the UV light bulb replacement indicator. The manufacturer estimates replacement life at 10-12 months, although a few owners have reported earlier bulb failures. Generally speaking, however, you can expect good bulb life as it’s a low-power bulb at only 5W. Therefore it’s not excessively hot like incandescent bulbs. On the AC4825 the blue glowing trim (which is the light glowing when the UV-C option is in use) will blink continuously when it’s time for bulb replacement. On the AC4900CA, which doesn’t have a similar glowing trim, the UV-C indicator LED will turn red. In both cases you’ll need to reset the reminder using the UV button after bulb replacement. The AC4825 indicates it’s time to replace the bulb by continuously blinking the blue light / trim on the front, while the AC4900CA does so by the UV-C indicator light turning red when it is time. I was surprised there was this minor difference, but given how the AC4825 allows the UV-C bulb to glow through the trim for a stylish effect and the AC4900CA does not, it does make quite a bit of sense. Here’s a simplified chart to help you see the differences in the GermGuardian blinking light patterns & meanings. Filter replacement is identical for both and is one of the easiest to replace that I’ve ever seen! It’s just a simple matter of pulling down the release tab, removing the cover, leaning the old filter out, and leaning the new back into place. Then you simply hook the cover back into place (with the tabs at the bottom) and snap the cover back in. You’re done! It takes all of about 10 seconds to do. As I mentioned near the beginning, both models share similar controls. Actually, they’re functionally identical and are extremely similar cosmetically. As you can see, they’re extremely similar, with the AC4900CA (left) having a small LED for indicating the UV-C germ killing option power status and the AC4825 (right) does not. It does, however, use the illuminated trim to do this (see earlier section). Both feature a power-on LED which, when green, indicates normal operation and turns red to indicate filter replacement should be checked. The fan speed control is superbly simple as you just switch it from the off position to speeds 1-3. AC4825 VS AC4900CA Pricing – Is there a difference? Yes, from time to time there is a difference in price despite their similarities. As prices tend to fluctuate up and down, it’s important to check the current pricing. They’re both great performers and are very well-reviewed. You can’t go wrong buying the cheaper model over the other one. To recap: both models are nearly identical and have only minor differences. Performance is the same – only a difference in style and where the controls are located. However as you saw above, you can potentially save a few dollars if you shop smart. I will note that if you’re very sensitive to light and are a light sleeper like me, the AC4900CA may be a better choice for you. The AC4825, with the glowing blue front trim, tends to illuminate the room a little bit at night. Many times I’ve been asleep but woke up later and noticed the glowing blue trim on the AC4825 when the UV-C feature was in use. To help you better make a decision, here’s a brief comparison chart the minor differences I’ve found in my comparison of the 2. 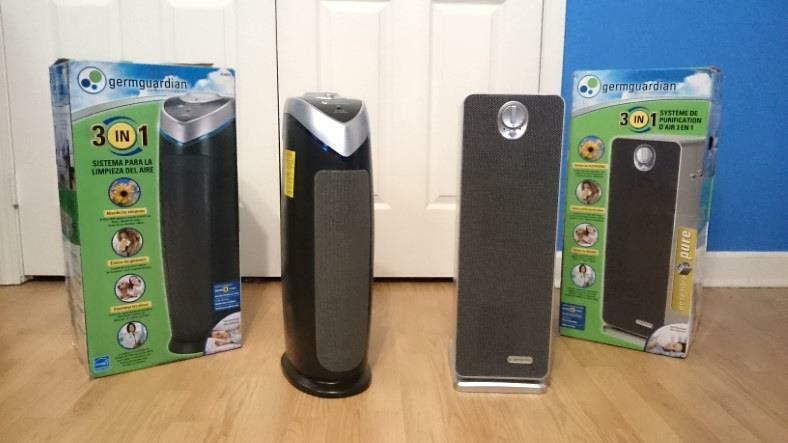 8.875 x 7.125 x 21.75"
These are great basic air purifiers that work well and won’t let you down. Operation is very simple, the true HEPA and activated carbon filters work well, and the filter & bulb reminders are nice. The addition of a UV-C germ-killing feature is definitely a big plus. You won’t be disappointed! If you’d like to know more see my detailed review of the AC4825 here. If the AC4825 or AC4900CA are still too expensive for you, don’t worry! I wrote a great post with some affordable models all under $100. My Hands-On GermGuardian AC4900CA Review - How Does It Rate? This is awesome. Was having a hard time deciding which to buy on amazon. Hey there – thanks for the comment! I’m really glad to hear that it helped.